This week on Weekends with Yankee, cohost Richard Wiese meets up with dune tour guide Rob Costa in Provincetown, Massachusetts, for an off-road ramble through Cape Cod National Seashore, taking in the magnificent views and stopping to visit one of the famous artists’ cottages there. Next, we travel down to Rhode Island and out onto Narragansett Bay to hear the story of the Rose Island Lighthouse, which has been keeping watch over those waters for more than a century. For our last stop, we board a ferry to the Maine island of North Haven, a place so beautiful the locals call it “North Heaven.” There, we discover a coastal farm like no other, and we bring some of its bounty back to the kitchen of Nebo Lodge, an inn and restaurant that draws guests from around the world. Back in the Test Kitchen, cohost and Yankee senior food editor Amy Traverso cooks up a cobbler made with real Maine blueberries. This week on Weekends with Yankee, we venture into the wild. First, cohost Richard Wiese boards a small boat off Chatham, Massachusetts, to accompany one of the leading researchers tracking the growing number of great white sharks along the Atlantic coast. From there we head to a remote corner of inland Maine to visit The Lost Kitchen, one of the most sought-after dinner reservations in the country. Finally, it’s off to the Northeast Kingdom of Vermont, where we go flying up and down the mountain biking trails of Burke Mountain, taking in stunning scenery at every turn. In the Test Kitchen, cohost and Yankee senior food editor Amy Traverso creates a delicious graham cracker pie using a recipe from The Lost Kitchen chef-owner Erin French. This week on Weekends with Yankee, we find proof that in New England, small is beautiful. We kick things off with an outing to a Connecticut Tigers baseball game, where cohost Richard Wiese meets fans who cheer on their minor-league heroes with big-league fervor. Next, we travel up the coast of Maine in search of the ultimate lobster roll, which leads us to an idyllic cove in South Thomaston and a classic little shack called McLoons. To round things out, we hike into the Ossipee Mountains to discover Castle in the Clouds, a hidden gem nestled high above New Hampshire’s famed Lakes Region. Back in the Test Kitchen, cohost and Yankee senior food editor Amy Traverso shares a fresh take on lobster chowder featuring saffron, tomatoes, and bacon. This week on Weekends with Yankee, we travel to Massachusetts to experience the unique and incredibly colorful tradition of cranberry harvesting, which the Gilmore family of South Carver has been doing for generations. Then bring your appetites as we head to Portland, Maine, where we’ll take you inside some of our favorite restaurants in this food lover’s paradise. Last but not least, we go off the beaten path in Vermont to explore Greensboro, which Yankee magazine editors call “the best little food town in New England,” and visit a cult brewer and a cheese maker that rank among America’s best. Back in the Test Kitchen, cohost and Yankee senior food editor Amy Traverso spins out an ale and cheddar cheese dip that makes the most of these classic Vermont ingredients. New England is filled with hidden gems, and this week on Weekends with Yankee, we highlight a few of our favorites. First up is Boston’s legendary Fenway Park and its Green Monster—both are well known, but behind the Green Monster we also find a tucked-away garden that provides fresh vegetables to food vendors throughout Fenway. Next, we journey to Chebeague Island, off the coast of southern Maine, to visit a decades-old, familyrun inn and harvest oysters straight from the waters of Casco Bay. Finally, learn why glamping is all the rage with our look at Sandy Pines Resort in Kennebunkport, Maine, where we feast on gourmet s’mores by the campfire. Back in the Test Kitchen, cohost and Yankee senior food editor Amy Traverso takes inspiration from those same decadent s’mores to create a uniquely delicious chocolate tart. This week on Weekends with Yankee, cohost Richard Wiese hikes New Hampshire’s White Mountains in the company of the “hut croos,” young men and women who pack food and supplies up steep trails to the famed rustic lodges along the Appalachian Trail. From there it’s over to Grafton, Vermont, a quintessential New England village of covered bridges, white picket fences, and maple trees. The Grafton Village Cheese Company produces some of the best cheddars in the country, and we go behind the scenes to see how it’s done. Then we jog north to taste some of the most sought-after bread in New England, made from local wheat that’s milled on-site at Elmore Mountain Bread in Wolcott, Vermont. Back in the Test Kitchen, cohost and Yankee senior food editor Amy Traverso whips up some Vermont cheese gougères, an inspired starter for any meal. This week on Weekends with Yankee, we spend an idyllic summer day on the shores of Cape Cod and stop in at the Chatham Bars Inn, named a 2017 Yankee Editors’ Pick as “Best Family Lodging” in the state. There, we experience the ultimate farm-to-table dinner, featuring local seafood and an array of vegetables just picked from the hotel’s own farm. Then cohost Richard Wiese heads to Rhode Island’s Narragansett Bay for a surfing lesson, and learns why there’s such surprisingly good wave action in New England. Lastly, it’s into the woods to forage mushrooms with chef Evan Mallett, multiple James Beard Award semifinalist for Best Chef in the Northeast and co-owner of the Black Trumpet in Portsmouth, New Hampshire. Back in the Test Kitchen, cohost and Yankee senior food editor Amy Traverso cooks up roasted carrots and herbed yogurt sauce, inspired by her dinner at the Chatham Bars Inn. This week on Weekends with Yankee, we explore how New England’s past continues to shape its present. First, we take a tasty trip back in time at Scott Farm Orchard in Dummerston, Vermont, which grows more than 100 apple varieties, some of which date back to the 1600s. Next, we swing through New Hampshire and find that old-school farming techniques are very much alive at Coppal House Farm, where much of the equipment is still powered by draft horses. For the finale, we hop aboard the historic windjammer J&E Riggin, a two-masted schooner built in 1927 that still sails along the Maine coast. Back in the Test Kitchen, cohost and Yankee senior food editor Amy Traverso takes inspiration from our orchard visit to make some delectable apple cider doughnut muffins. This week on Weekends with Yankee, we see the very best of New England. Our journey begins in the charming village of Hanover, New Hampshire, which Yankee magazine editors say is “the best college town” in New England. Then it’s south to Rhode Island, where cohost Richard Wiese strolls through The Elms, one of the most breathtaking of Newport’s Gilded Age mansions. Finally, we head to Martha’s Vineyard, off the coast of Massachusetts, for some of the most succulent sea scallops in the world. Back in the Test Kitchen, cohost and Yankee senior food editor Amy Traverso shows us how to pull off a terrific, easy-tomake baked scallop dish with garlic and vermouth. This week on Weekends with Yankee, we spotlight the flora and fauna of New England. Starting things off is a visit to Vermont’s Shelburne Farms, a historic property on the shores of Lake Champlain where teams of farmers and food artisans raise Brown Swiss cows and make delicious cheeses from their milk. Next, we travel to New Hampshire’s Lake Winnipesaukee to connect with top Boston chef Brendan Pelley, who shares the story of how growing up at his family’s cabin there shaped his cooking style—which he demonstrates with some delicious lake trout prepared over a campfire. Then it’s off to Connecticut, where cohost Richard Wiese casts for trout with James Prosek, a fisherman, artist, and author who celebrates the beauty of this revered fish in his work. Back in the Test Kitchen, cohost and Yankee senior food editor Amy Traverso makes a simple but elegant orzo salad with smoked trout. This week on Weekends with Yankee, cohost Richard Wiese cruises around New Hampshire’s Lake Winnipesaukee aboard the Sophie C, the oldest floating post office in the United States. From there, we make tracks to Rockport, Maine, where lobsterman and photographer Joel Woods gives us a view of deep-sea fishing that few people ever get to see. Closing things out is our jaunt to the rocky coast just outside Acadia National Park to experience a genuine Maine clambake with three of Portland, Maine’s hottest chefs. Back in the Test Kitchen, cohost and Yankee senior food editor Amy Traverso brings the clambake home as she creates a stovetop version of this classic New England meal. This week on Weekends with Yankee, we celebrate the ultimate New England season, autumn, in all its multicolored glory. First, we hike up to Holt’s Ledge in Hanover, New Hampshire, and get a fall color tutorial from photographer Jim Salge, the resident foliage expert for NewEngland.com. Next, we head to Vermont for an autumn visit with goat farmer and cheese maker Allison Hooper, whose Vermont Creamery has helped put New England cheeses in the national spotlight. Finally, the editor of Yankee magazine, Mel Allen, takes us on a tour of New Hampshire’s Kancamagus Highway and shares some of his favorite out-of-the-way vistas on one of America’s most scenic highways. Back in the Test Kitchen, cohost and Yankee senior food editor Amy Traverso makes a beet salad with fried goat cheese. This week on Weekends with Yankee, we explore New England in wintertime, a season of snowy adventures and breathtaking beauty. We start off with a visit to historic Lexington, Massachusetts, the town where the first shots of the Revolutionary War forever changed the course of this country. While there, cohost and Yankee senior food editor Amy Traverso cooks up a New England artisan dinner with chef Stacy Cogswell at the Inn at Hastings Park, and puts a spotlight on some of the regional designers and food makers who represent New England’s legacy of craftsmanship and entrepreneurial spirit. Next, it’s up north we go, to Nestlenook Farm in Jackson, New Hampshire, for a journey back to the winters of yesteryear on a horse-drawn sleigh. And with the holiday season in mind, we wrap up with some suggestions for great New England food gifts that can be made quickly and easily in the kitchen. 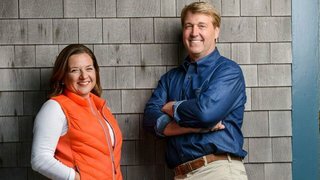 Weekends with Yankee is New England like you have never seen it before: 13 episodes that highlight the region’s most unique attractions, take viewers on amazing adventures, and showcase some of the most successful chefs and culinary artisans in action. Shot in a cinematic, documentary style, the series serves as an insider’s guide to New England straight from the experts at Yankee magazine. Co-Hosts Richard Wiese and Amy Traverso Emmy Award–winning explorer Richard Wiese returns as series co-host with Yankee senior food editor Amy Traverso. This season, the duo embarks on separate journeys, which are woven together to create the ultimate New England road trip. Wiese is a world-class adventurer who takes viewers into the field for once-in-a-lifetime experiences. Traverso, a leading authority on New England cuisine, serves as our essential culinary tour guide. New for Season 2: an “In the Kitchen” segment, in which Traverso prepares delicious dishes inspired by her travels, using iconic New England ingredients. Along with recipes, she offers cooking tips and expert advice for eating well in every season. The series airs Mondays at 7:30 p.m.